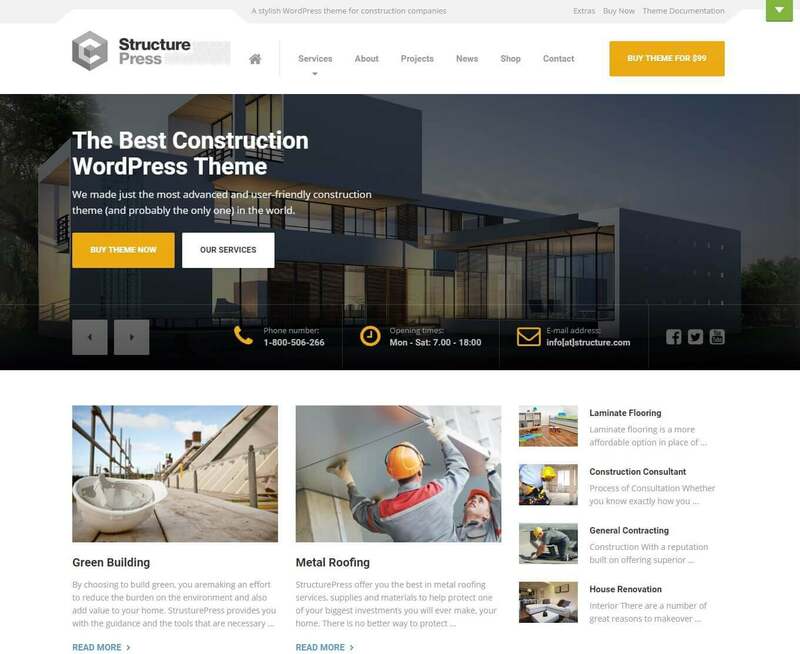 List of 20 professional Construction WordPress themes for 2018. List of 20 professional Construction WordPress themes for 2018. It can get daunting searching for the best WordPress theme for your business. As a business in the 21st century, having a strong online presence is an advantage. Furthermore, how you present yourself on the web directly affects your conversion rate. Therefore, having a functional user-friendly website is of paramount importance. Today we have a plethora of WordPress themes designed specifically for businesses. They come preloaded with demos, templates, and web building tools that are user-friendly even to the amateur webmaster. Some also get regular updates free of charge or include premium plugins that would otherwise be paid for. The type of WordPress theme you choose depends on your needs as an enterprise. Ideally, you need a WordPress theme that will load faster, remain stable even in high traffic, or is compatible with multiple browsers. And this is just a tip of the iceberg. Fortunately, we have compiled a list of 20 professional WordPress themes voted the best for 2018. 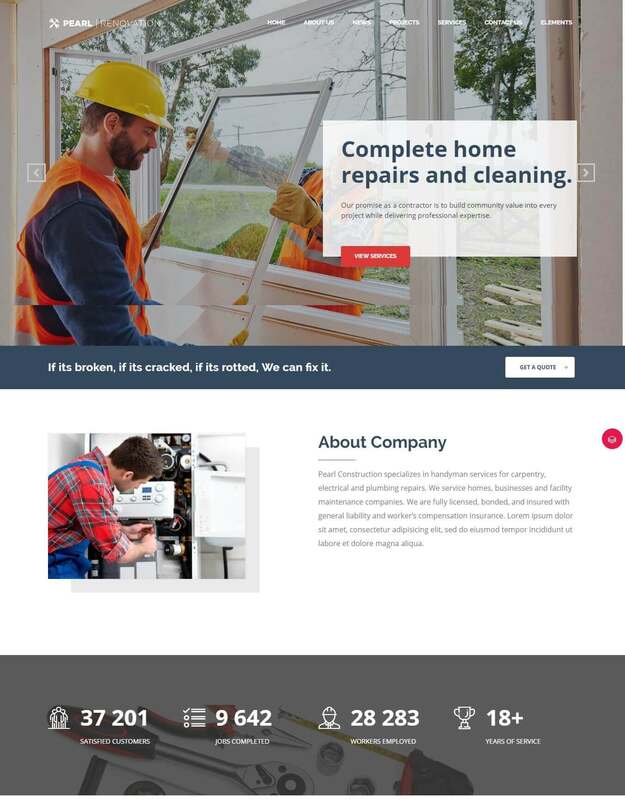 Whether you work in the manufacturing, construction, laboratory, or industrial sector, this WordPress theme is for you. It brings life to a professional that we all overlook. Industrial WordPress theme comes with preloaded features that make web building easy even for the industrial worker. This WordPress theme utilizes the visual composer plugin to create and edit web pages. You have over 7 premade homepage layouts to customize and add your content. Industrial theme also comes with over 500 google fonts to add an impressive typography to your webpage. An inbuilt color variation feature lets you play around with colors and make your content stand out more. Free custom icons are included to highlight your content better. Another useful feature is WPML plugin that allows you to customize your website in any language you wish. Industrial WordPress theme is integrated with WooCommerce to add a convenient checkout shop on your construction website. It only takes one click to fully install this theme and start editing. There are free demo websites provided to give you a head start. 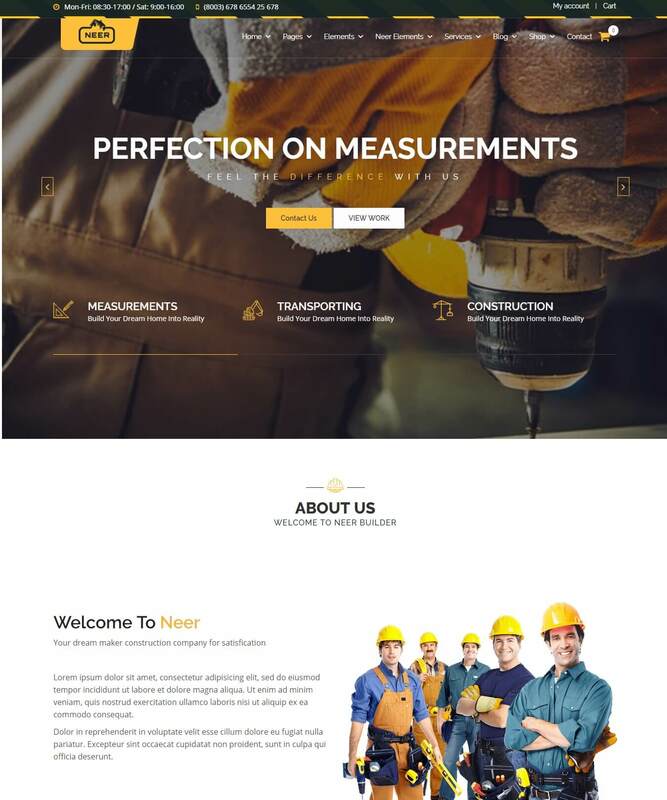 Neer WordPress theme is tailored for the construction business. It comes with an inbuilt page builder that is voted one of the best in creating and editing web pages. 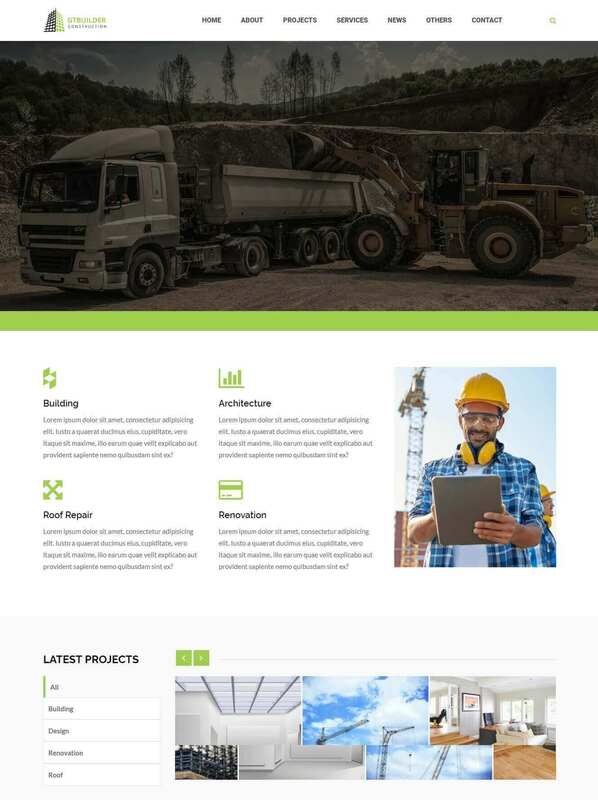 This WordPress theme also suits any company in the engineering, commodity, machinery, and architecture sectors. Neer theme uses WPBakery to install and start editing your new homepage. Another useful tool is Font Awesome which is preloaded with hundreds of impressive fonts to make your content stand out. There are plenty of widgets provided to reinforce the overall look of your website. Neer WordPress theme is pre-installed with Contact Form 7 to provide your clients a way to communicate with you directly. You can also install MailChimp to update your clients on new products or services via email. WPML plugin is included as well which allows you to edit your website in any language. Neer is 100% responsive to any mobile device or desktop screen. As the name suggests, Construction WordPress is designed for professionals in the architectural and building industry. It also suits the architect or contractor running a freelance business. 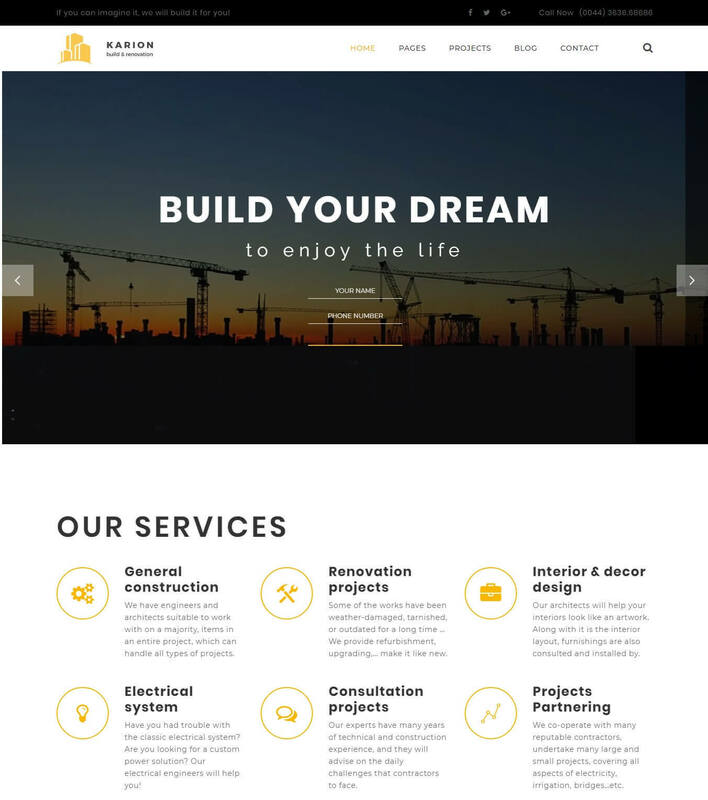 Construction theme will give your business the representation it deserves and helps upscale its conversion rate. There are 11 PSD files provided for graphic designers. If you know nothing about design, no worries, a user-friendly page builder is included to drag and drop elements as you design your homepage. Construction theme also comes with revolution slider for adding attractive slider pages, especially when showcasing your services or products. A free drop down menu is available to lead customers directly to the content they want. Your one-page website is divided into 6 sections which include Clients, Services, Projects, Slider, Staff, and Testimonials. 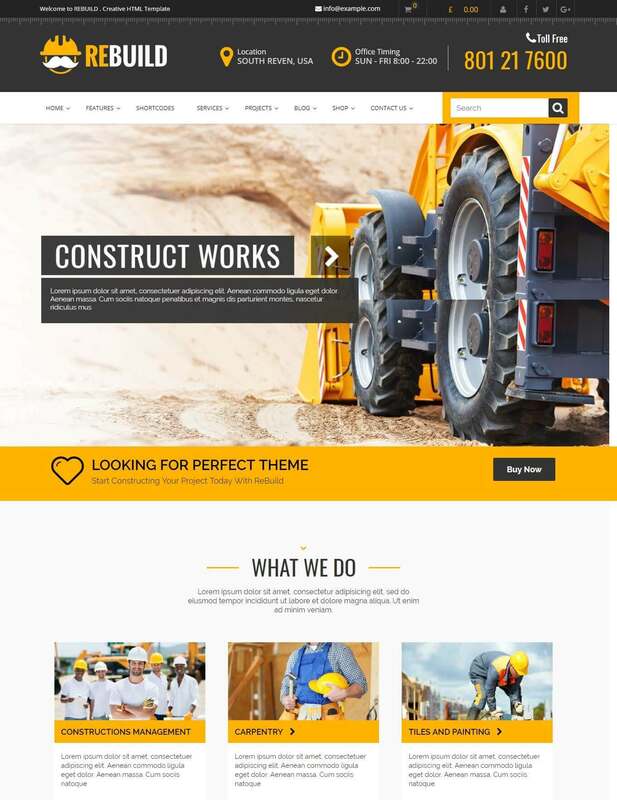 Construction theme comes with a blog template as well, providing you a convenient platform for instant blogging. Other premium plugins to look forward to are WooCommerce for online shopping and WPML for multi-language support. You also get free widgets to further tweak your website making it simple and professional. Pithree lets you design a fully professional website without taking any class in coding. On top of that, you get premium plugins to help set up an online shop or translate your website into several languages. There are demo templates that install in one click and have you design your web pages in minutes. Pithree works with visual composer which is a popular page builder. It comes preloaded with shortcodes you can use and not have to code your own. Slider revolution is included to create beautiful sliders where you showcase your various products. Create amazing typography for your website with Google Fonts and Font Awesome. Pithree includes parallax backgrounds for your images or videos. Play around with different colors and the many slider options to make your website as unique as possible. This theme comes inbuilt with a blog template which you can use to publish your content. Incorporate WooCommerce to your Pithree website and transform it into a one-stop online shop. 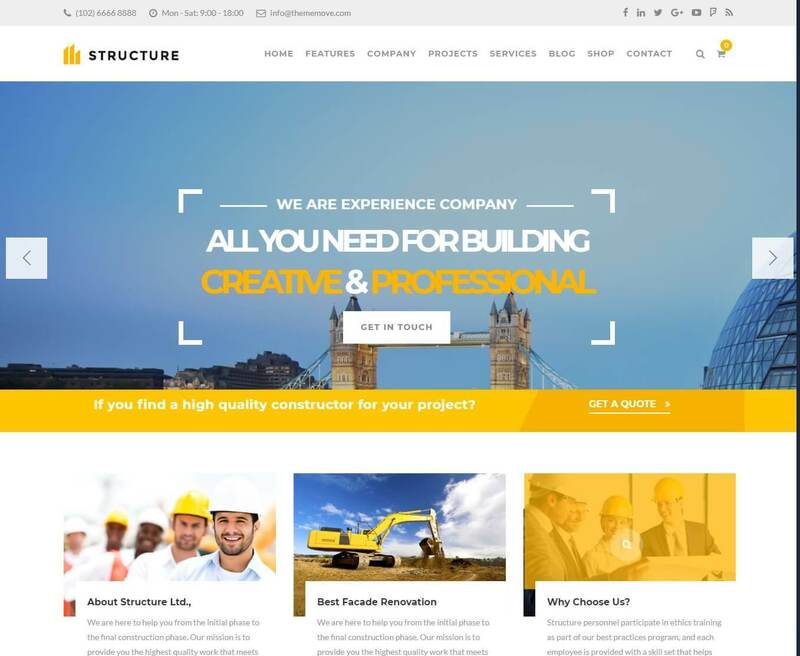 Structure WordPress theme is for the construction business wanting to improve their brand image and conversion rate. It packs premium plugins that are availed with the theme absolutely free. You also have multiple layouts to worth with and come up with an amazing web page. Structure theme ensures your website does not look dull. Even for a construction business, you have plenty of color combinations to use in making your website standout. Multiple sidebars are provided to pick the one that will give your users the best experience. 6 headers are available as well to ensure your website looks different each time your users visit. Use the live customizer to view all the changes you make in real time. Structure theme is preloaded with multiple google fonts to improve your web page typography. Premium features provided absolutely free include Mega Menu, Essential Grid for arranging your posts, WooCommerce for online selling, and Contact Form 7 to reach out to your users. LeadEngine WordPress theme is built to fit in with any business outfit. Whether you run a construction company or run an online shop selling clothes, this WordPress theme is for. It puts together premium tools and plugins that make the web building experience a breeze. LeadEngine comes with 30 free demos that install with one click. This simplifies your web building process using the provided designing tools. 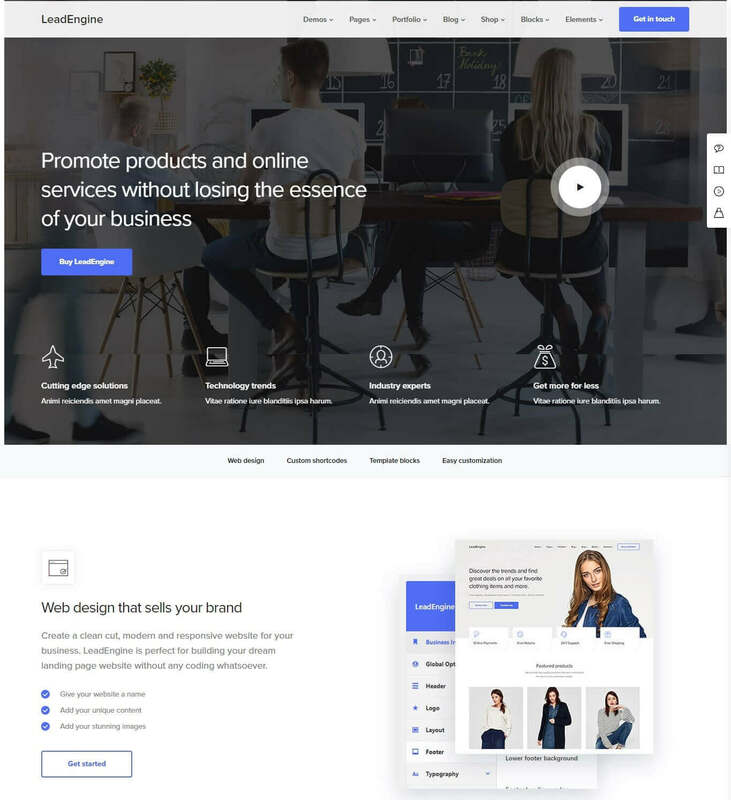 LeadEngine WordPress theme is inbuilt with WPBakery page builder that makes web designing as easy as dragging and dropping elements. Over 200 template blocks are provided which means you never run out of new ways to present your website. A premium plugin revolution slider allows you to create custom sliders to add visual interest. In addition, the icon builder, IconsMind Pack, is incorporate which comes packed with over 2000 premium icons. LeadEngine supports instant blogging with the available custom blog templates. You have over 30 portfolio layouts to help you present your work to clients. This word press is fully responsive on any desktop or mobile screen you open it on. Handel is a responsive and versatile WordPress theme. It suits the startup or established company providing services in accounting, consulting, corporate, finance, construction, and law. It also suits transport and logistics companies as well as IT or Hosting online businesses. Handel comes with a unique page builder known as Codeless Builder. The page builder contains useful tools like inline text editing to click and edit your content on the spot. You can also edit your portfolio and preview the changes you made live. Handel WordPress theme also comes with templates for creating tables, bars, lists, or charts that will help highlight your content. Your online users can download your content instantly via the File for Downloads plugin. Scroll through 200 plus prebuilt content templates then click and install whichever you like. Work with custom header styles to make your logo and menu bar standout. In addition, Handel theme support third party plugins like MailChimp, WooCommerce, WPML, Envato Toolkit, TablePress, and WordPress charts. Karion is a full page WordPress theme that would suit any business dealing with construction or renovation. 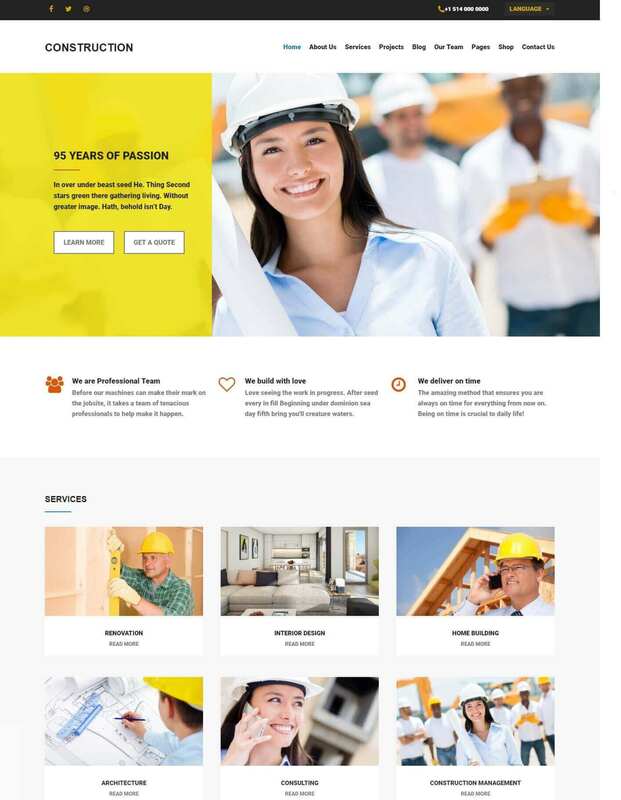 It comes with 4 unique homepages and a host of premium plugins to design the most professional and interactive construction website. Karion is built on Bootstrap and has readymade shortcodes to add visuals, images or any other content on your website. Karion theme uses the popular Visual Composer plugin to create custom web pages without writing code from scratch. Slider revolution is included for presenting your content in visually appealing sliders. Essential Grid plugin ensures you arrange your posts in a unique chronological manner putting your best content first. This WordPress theme is highly responsive and is compatible with popular web browsers. Contact 7 form plugin helps you customize your online sign in forms. Karion also supports WPML plugin which allows you to translate your content into multiple languages. New updates are rolled out periodically ensuring your website will always keep with the trends. 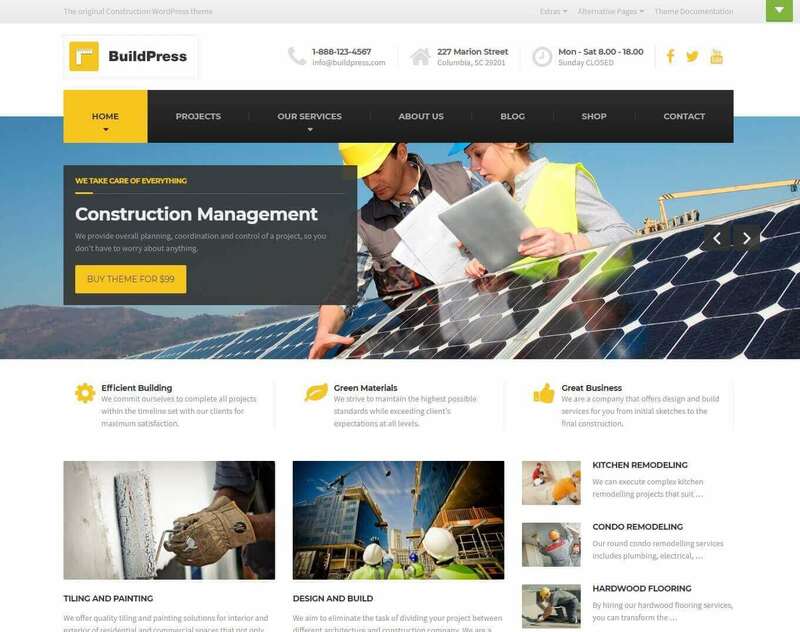 BuildPress is a high-end WordPress theme available for the construction and landscaping business that is serious about going online. It comes with pre-built demos that import in one click. BuildPress also features premium plugins and custom templates to help with building your online presence. This WordPress theme supports the latest version of Visual Composer. Visual Composers provides a user-friendly platform for custom designing web pages fast. You do not need to be a webmaster to work with page builder and there are free web demos available you can edit and upload as your own. BuildPress supports premium plugins like Essential Grid for creating unique galleries to showcase your work. WooCommerce plugin is integrated as well to establish an online shop where you sell your products. There are plenty more widgets and design tools to ensure you fine tune your website to perfection. BuildPress theme is 100% responsive and is retina ready. Other premium plugins supported by BuildPress include JetPack, Contact Form 7 and Custom Sidebars. 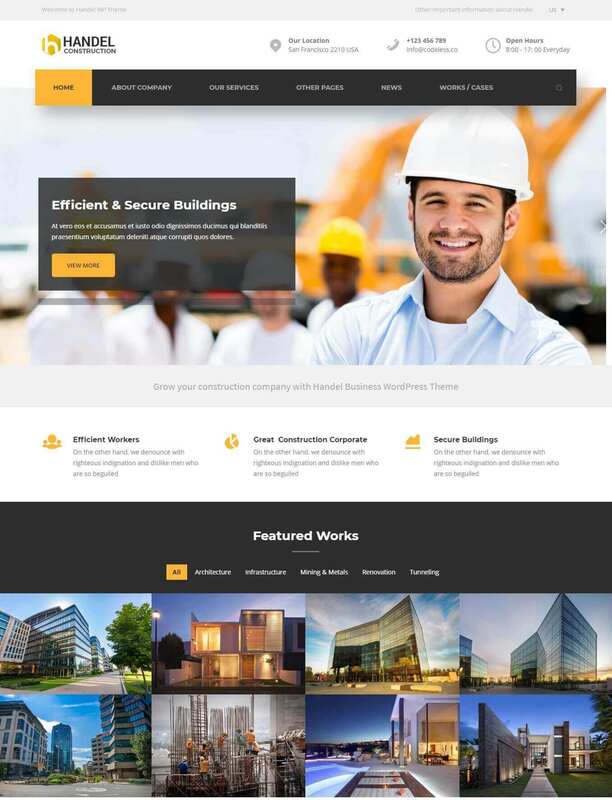 GTBuilder is a smart and very responsive WordPress theme designed for construction and building companies. Alternatively, it can also serve as a convenient template for crafting a personal website. Whether you work for a company or run a private business, this WordPress theme has what it takes to give you a strong online presence. Visual composer plugin is integrated into GTBuilder. This will be your interface for crafting a professional website with simple drag and drop commands. Revolution slider plugin is added as well to help you switch up layouts in one click. You can also change headers, footers and color combinations to make your website stand out. There are over 4 unique page layouts to install and start editing. You can also import a ready-made demo, make a few tweaks and have a functional website in minutes. More premium plugins that come with GTbuilder theme include WooCommerce and WPML. Online selling is made easy even for a construction company so is sharing your content in multiple languages. Pearl WordPress theme is highly versatile and fits every niche. It is a perfect theme for a bakery, medical institution, fashion house, and even an online foodie blog. Pearl has been voted as one of the fastest loading WordPress themes boasting of a 99% page speed score. This WordPress theme is preloaded with handmade demos that install in minutes with just one click. Use the premium plugin WPBakery page builder to customize web pages to make them unique and reflect your brand. You have over 200 content modules to scroll through and choose one that befits your website. Customize columns, complete sections, enlarge or resize menus using Pearl Mega Menu plugin. Pearl Slide is included as well to create responsive slideshows that transition between content smoothly. Another useful premium plugin is IconLoader for loading and customizing icons to accentuate your online content. If you need to monetize your website, WooCommerce plugin is there to help you out. Interact with your audience using Contact Form 7, MailChimp, Twitter, and Instagram Plugins. 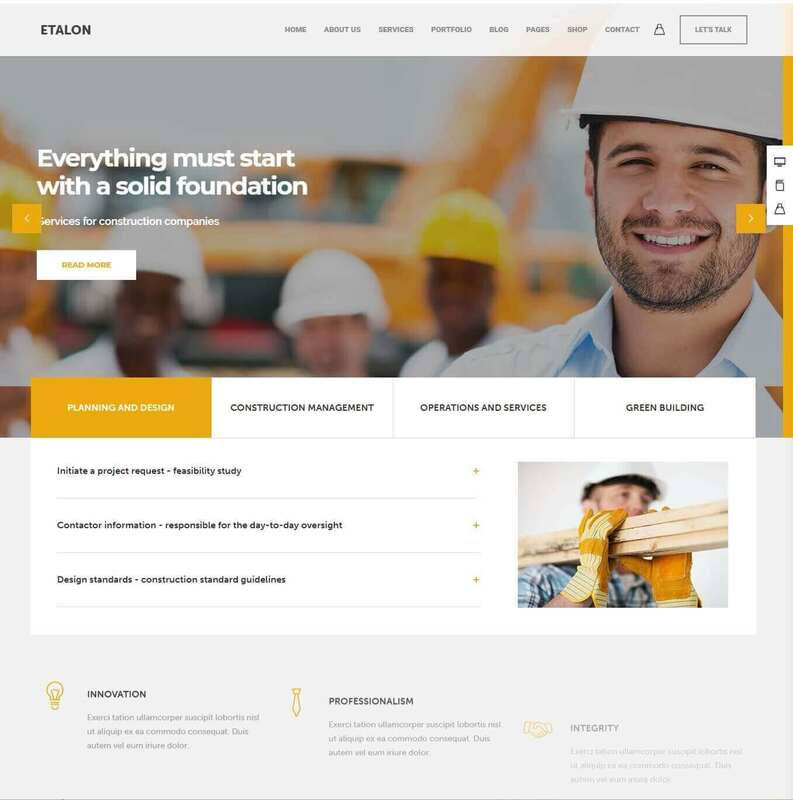 If you need a WordPress theme that fits multiple business concepts, Etalon is the theme for you. This one is designed for SMEs and business professionals wanting to establish an online presence. In addition, if you need to update your website with something sleeker and highly responsive, Etalon gives you just that. Like most high-end WordPress themes, Etalon uses visual composer to help the user design their site. Everything is a simple drag and drop process as you rearrange elements the way you wish. There are over 20 free demos to import in one click and start using. Another feature you will love is Carousel Portfolio which lets you showcase multiple portfolios at once. You can also create carousel templates for your testimonials. Your users can check your website credibility without having to scroll down a long list of user comments. Add parallax scrolling to wow your users and also give them a seamless user experience. Etalon is optimized for smartphones and any other mobile device. 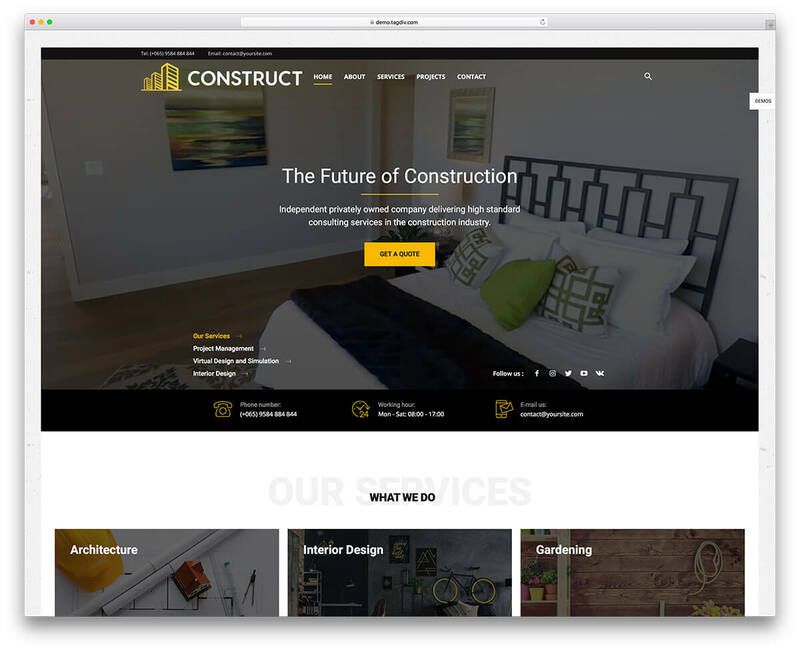 If you own a construction website, it does not have to look dull. 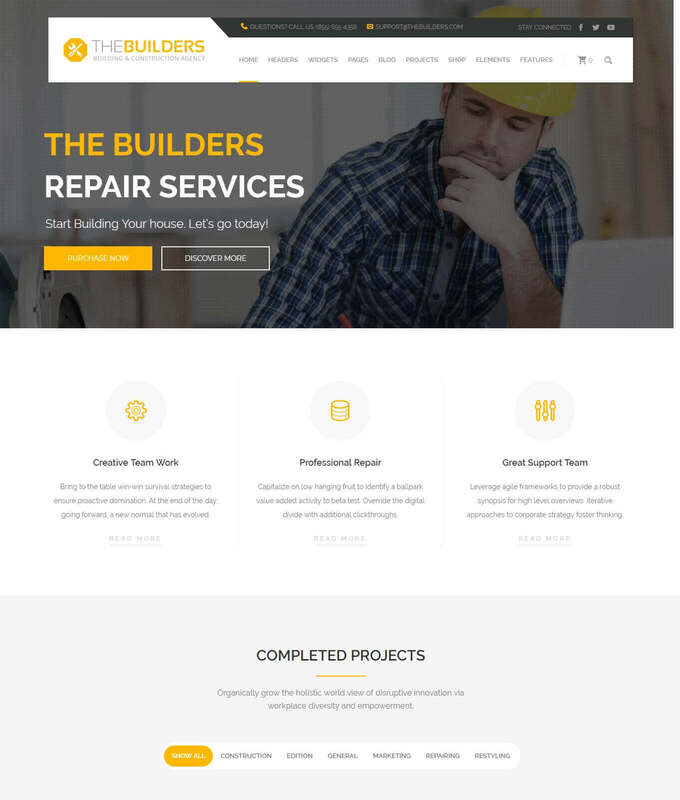 You can use The Builders WordPress theme to present your best work in the most professional and appealing way. In addition, you do not have to be a pro webmaster to use this theme. The Builders is integrated to Visual Composer page builder. It allows you to drag and drop elements on the prebuilt web templates without having to program any code. There are over 50 free elements waiting to be unboxed and used in improving your website look. Navigate through unlimited font and color options and choose what will make your website stand out. WPML plugin is included to translate your website into any language you wish. The Builders is designed for multiple page design but you can also organize everything as a one-page website. Add the popular parallax scrolling effect to keep your users interested as they scroll to the end. ReBuild adds life to your website whether you are in the construction or building sector. The best part about this WordPress theme is the weekly new demo releases. It gives a chance to revamp your website and ensure it never looks boring. ReBuild theme can be used even with those businesses owners with zero knowledge of programming. Visual Composer plugin is provided to do all the heavy lifting as you design your website with ease. Make use of other features like Essential Grid to organize your website content in a clean easy to scroll look. Slider Revolution is there too in case you want to add visually appealing slider content. If you want to turn your site into an online shop, you can do that with WooCommerce Plugin. ReBuild also comes with multiple blog templates and header styles to ensure your content will always capture your user’s interest. ReBuild is designed with high graphics to suit HD screens as well. The name gives it away, Newspaper WordPress theme is designed for all media houses and publishing companies. It suits online news blogs, magazines, review sites, newspaper sites, and any publishing website. It takes one click to install this theme and instantly share your news content. Newspaper theme uses tagDiv Composer which is a page builder designed specifically for media houses. Everything takes on a drag and drop process so you do not need to learn how to code. Make changes instantly and watch how your webpage is coming up in live view. This WordPress supports important news plugins like BuddyPress and bbPress forum. In addition, Newspaper theme is integrated for YouTube so you can share your videos or activate live reporting for your users. Make use of Ultimate Typography plugin to optimize your content for various mobile devices. We have optimized the Newspaper theme for SEO to help you gain organic searches and boost online presence. 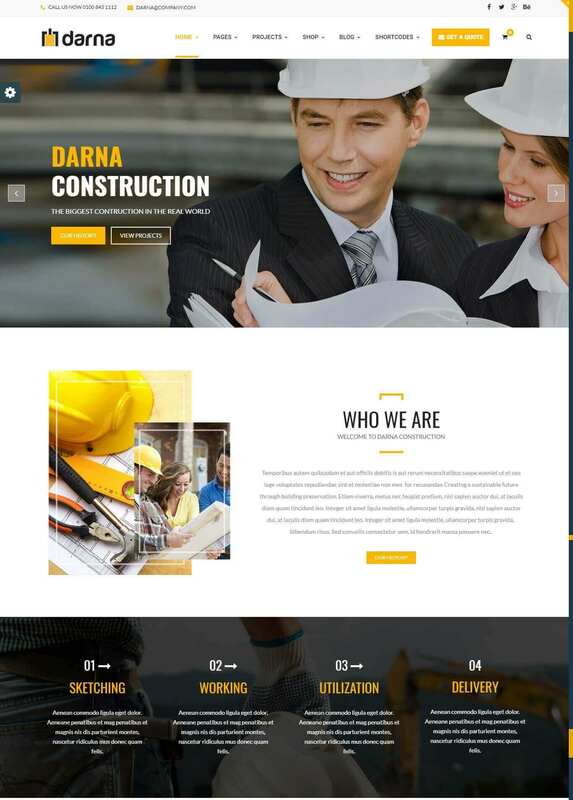 Darna WordPress theme installs in one click and launches your website go live in minutes. It is suited for the building or construction business that wants a highly responsive website that is compatible across multiple browsers. You do not need to be a programmer to start designing your website with this theme. All the tools you need to custom edit your website are provided. Visual Composer is included for editing web pages on the spot without writing a line of code. Another drag and drop editor is Revolution Slider. This one allows you to create interactive and visually appealing sliders. One more useful plugin is Mega Menu which allows you to create and customize menus for your site and add items like images or maps. Darna WordPress theme comes with free website demos. Select a demo you like and install it with one click. It is also possible to monetize your blog or website by adding WooCommerce plugin. To access your website internationally, WPML plugin will provide multi-language support. Craft a professional website in minutes using Constructzine Pro. 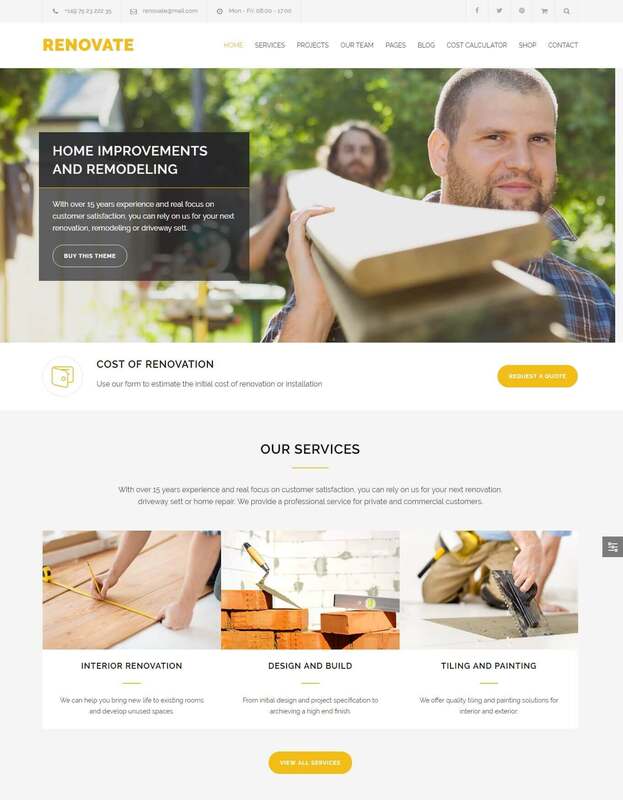 This WordPress theme suits the pro contractors wanting to display their best work online in a simple interactive website. Everything you need to build a pro website is provided and no, you do not need to be a programmer. Use the inbuilt drag and drop editing suit to start arranging elements the way you want them. Update your logos, colors, social links or page layouts using the provided Theme Options panel. Constructzine Pro comes with unlimited color choices to ensure your website stands out from the competition. This theme also includes a text editor that helps you translate your content into multiple languages. Constructzine Pro is 100% responsive and compatible with popular web browsers. Add premium plugins like WooCommerce and start selling your products or services right away. There are endless ways in which to edit this theme and craft a unique website. You can also preview how the theme works by installing the free demos provided. Construction and renovation companies can make use of Renovate to put their best work online. This WordPress theme is colorful, light and makes your content stand out. A free demo is provided that installs in one click. You are free to edit the provided demos and make them your own. However, for more control, you can use the provided Visual Composer plugin to build web pages from scratch. You only have to drag and drop elements on a live interface so there is no need for coding. Renovate avails over 50 content elements to customize your website with. Use the built-in color picker to decide the best color scheme for your website. Use Smart Sticky columns to ensure your menu bar is always within reach even when scrolling to the end of pages. If you are going to make money off your website, you can do that with the premium WooCommerce plugin. Cast WordPress theme comes with the flexibility required for building a highly responsive website. 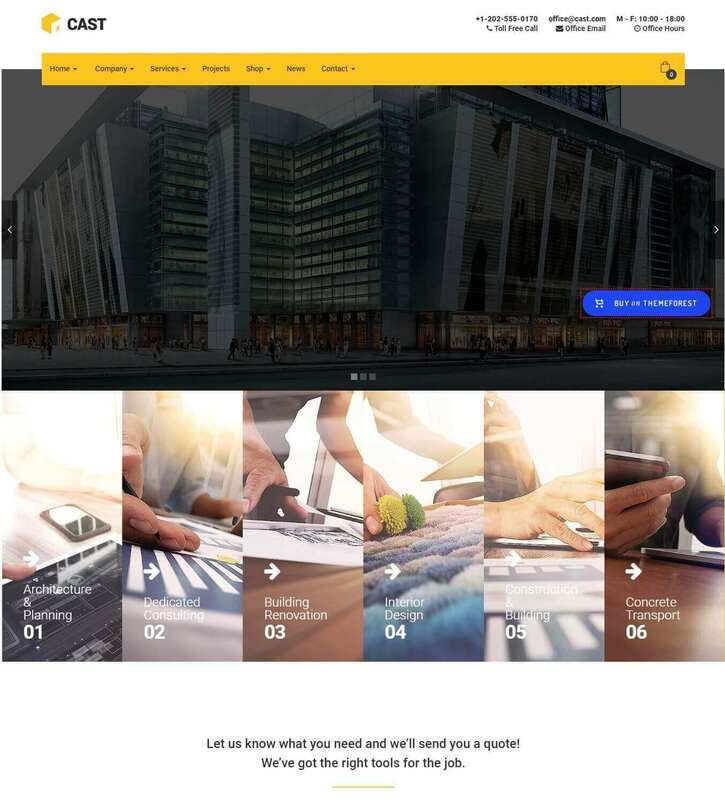 This theme suits any construction or renovation business that wants to instantly launch a website without having to go through the pain of programming. You will get some premium plugins as well to improve the user experience of your website. There are four unique home pages to staff you off on the designing part. Use the inbuilt visual page builder to arrange items however you wish. Cast theme provides free demos that can be installed right away and save time on designing. Edit your headers and footers to add your logo and any important your users will find useful. Cast also gives you access to premium plugins like Slider Revolution and Essential Grid. Both plugins help in custom designing your web pages by adding slides and grids that create visual interest for your users. Add a quick cart view feature to help customers preview their purchase before checking out. 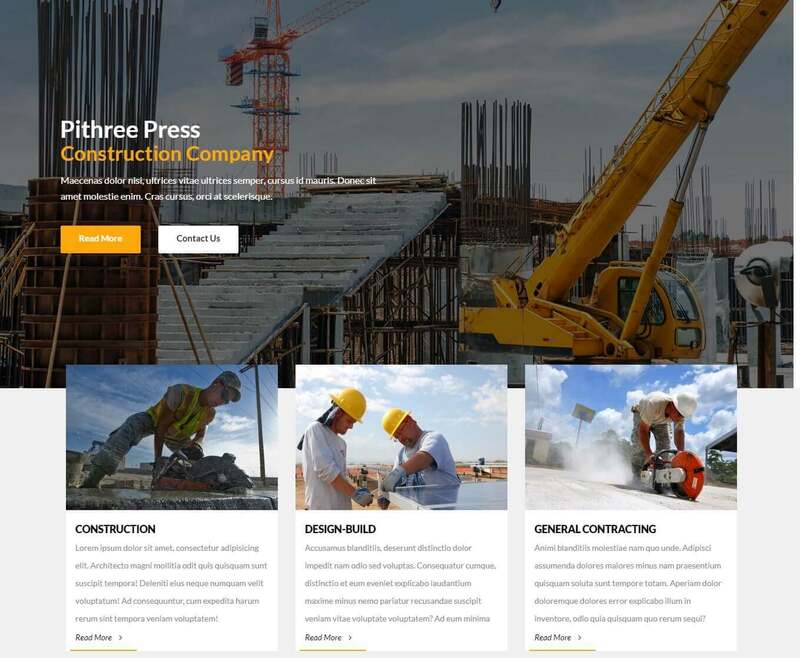 StructurePress WordPress theme provided a ready template for construction and architecture companies that want to build a website. This theme comes preloaded with a free demo to install in one click. It cuts the time to design a website by half and you do not have to be a programmer to use it. StructurePress uses a page builder designed by SiteOrigin. It takes away the complex coding process as you drag and drop elements to see how they fit the overall look. Use custom widgets to showcase your project or portfolios in the most professional way. Your users will enjoy the responsive design of this theme on different screens. You are also provided with free contact forms to help manage contacts and new sign-ups. Any layout you choose has HD graphics which is ideal for retina displays. Use the WPML plugin to translate your website into any language. We have included the PSD files for advanced programming.